Demetrius Doss | The College Funding Coach Demetrius Doss | Paying for college without jeopardizing your retirement! 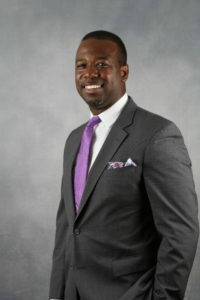 After playing professional football, and a three-year career as an executive in the music industry, Demetrius began embarking on a passionate calling in the financial services industry in 2011…..after a close friend lost his father who passed away with no will and no financial security for his family. The death devasted that family emotionally and financially, and thrusted Demetrius on a personal journey to help families not have to live through the nightmare his close friend went through. Since 2011, Demetrius has been educating and working with families to create solutions for their biggest financial worries. Whether it’s creating a road map for a financially stress-free retirement, leaving a legacy that last generations, or how to effectively pay for college for your children and not decimate your retirement nest egg, for families with these financial worries Demetrius could be a godsend. Demetrius graduated from THE Marshall University in Huntington, WV, where he played wide-receiver with two Heisman quarterback finalists…..Chad Pennington and Byron Leftwich. He currently lives in Prince William County, VA, with his wife Kelli and their two sons. Demetrius is also an AAU basketball coach for two teams with the United Revolution in Prince William County.